The remaining facade of the Anhalter Bahnhof. In the background you can see a sports field and the Berlin Tempodrom. You can see that the remaining section is large and elegantly decorated. But you can also see that it is only a small part of what was once a much larger building. I Googled photos of the original building, and came across the below pictures. The original facade and building. The remaining facade is the section right in the middle of the old photo. Pretty cool, right? From this photograph, which was taken in 1900, you can see that the remaining frontal section accounts for only a small portion of the original building. According to Wikipedia, a train station was built on this site as early as 1841. But the building you see in this photograph, and which you can see under construction in the below picture, was not begun until the 1870s. 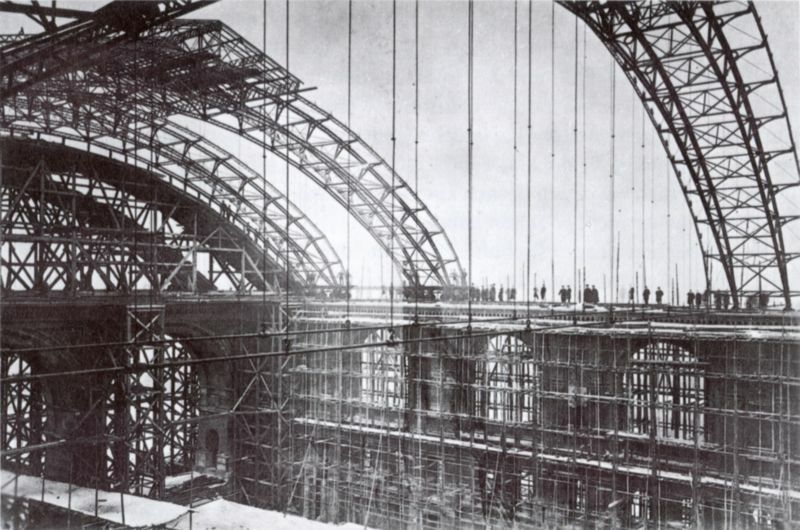 When it was finished, it was the largest rail station in Germany and (at the time) the largest in continental Europe, though it was later surpassed in size. You can understand the enormous scale of the station by looking at the men standing on the wall on the far side of the station. By the late 19th and early 20th centuries, the Anhalter Bahnhof was one of the busiest stations in Berlin, serving as the terminus for a number of southern rail lines. It was also directly across the street from the Hotel Excelsior, which at the time was Europe's largest hotel. The Excelsior was destroyed during WWII and no longer exists. The train station itself was also heavily damaged during the war. Post-war, the station was located in the Allied-controlled section of the city, which eventually became West Berlin. The East/West partition meant the end of regional rail service, and the station was closed for good in 1952. Complete demolition began in 1960.
hat might have been the end of the story, but as I've written before, Berlin is unique in how whispers of its past manage to stick around for so long. The facade is an example, but there are also other examples from the Anhalter Bahnhof. This is the facade from behind. As you can see, soccer fields were installed on the site of the train station. he site of the train station was repurposed in a number of ways. As you can see in the left photo, one new use of the old train station site is as a sports (and in Europe, "sport" nearly always means soccer) complex. n interesting sidenote: the dark windows in the very top left corner of the building behind the facade belong to the Solar Bar. You take an elevator up to the top floor and get good views of the city while drinking your expensive drinks and eating your expensive food. A good tourist location, but not somewhere I would go again. Behind the Tempodrom is where things start to get really cool. There is a small wooded park, but if you look closely through the trees you can see outlines of concrete platforms. These are what remains of the original passenger platforms from the train station. Walking through the woods, you're immediately transported back 70, 80, even 100 years. You imagine passengers running along these platforms to catch their train, or conductors blowing their whistles for departures. You see the platform edges and the grey stones in the track beds and imagine who might have once stood right there in front of you. The trees are as thick as people once were, and you wonder whether they could have imagined what the future would bring. You imagine who might be walking through your life 70 years from now, when all that's left is history. hile the platforms end, the old track beds do not. They carry the visitor across the old Landwehr Canal into Gleisdreieck Park. Footbridge over the Canal. The bridge is located where the old rail bridge used to be. You can see the U-1 train passing overhead. The tracks continue on the other side of the canal in Gleisdreieck Park. The old tracks continue their journey in Gleisdreieck Park on the other side of the canal. You can still see a number of old rail lines making their way through the trees. The effect is surreal, as you imagine the hundreds of trains and thousands of passengers that passed over the very spot where you are enjoying a nice quiet walk through the trees. The rails are like ghosts. They're reminders of a different era, and of how nothing is permanent. But even so, history leaves an impression. he old Anhalter Bahnhof rail lines end their journey in Gleisdreieck Park. The Park is a lovely re-imagination and re-use of the remaining track beds. It also happens to be about 600 meters from my apartment, so I often run through the park and relax there. The Anhalter Bahnhof is an example of Berlin embracing its present while remembering its history. Other cities might have sold the land to developers, or completely removed signs of a complicated history. Instead, planners preserved what they could while making usable spaces for current residents. The result is a layering of the past on the present, with both serving as the foundation for the future.